Now that you have all of your ingredients (see part 1), we can start making bread. This is not going to be your "wham! bam! done in an hour!" bread, but bread that takes time and patience. This bread will be holey, chewy, and it will taste like more than the sum of its parts. Seriously. Allow me to give you a little overview of what we are about to embark on together: bread leavened without the use of rapid rise, commercial yeast has three stages. These three stages have French names: chef, levain, and pain au levain. A chef has the consistency of pancake batter, and it is your Mother of All Breads. It's a primordial soup consisting of yeast, alcohol, lactic acid, and other goodies that I don't know how to pronounce, let alone spell. You feed your chef a modest meal of flour and water daily or weekly, depending on how frequently you plan on baking, and with every feeding, you must sacrifice some chef to the bread gods. Why must you make a sacrifice? 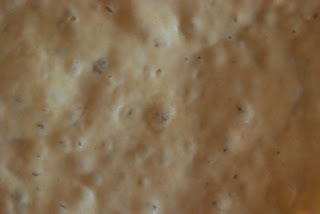 Because if you did not, you would have to feed your chef more and more flour and water to support the cultivated yeasts. Some heathens suggest pouring the chef sacrifice down the drain, but I prefer to pour it into a hot skillet with the bubbling fat of my choosing to create a crispy pancake. When you're tired of feeding the freeloading chef and you want some payoff, it's time to make the levain. Instead of having a pancake batter consistency like the chef, a levain is stiffer. This makes sense, because the only thing you do when transforming your chef into a levain is add flour to your chef. A levain ferments anywhere from 8-10 hours before it is ready for its transformation into bread dough. If you wait any longer to make your dough, the levain looses it's oomph. The yeast population will be on the decline and will not be lively enough to raise your dough. I need to make a bumper sticker that proudly states "Fermentation is your friend!" My favorite foods and drinks are all fermented. But, I digress... Back to bread basics. Once you have a ready and willing levain, you take part of it for bread dough (pain au levain means bread made from a levain) and part of it to make more chef. Hence, the cycle continues! Breadalong participants, it is now time to make your very own chef. You'll be making a chef for 3 days. On the fourth day, you make a levain, and if you make that levain in the evening, on the fifth day you shall have bread! Are you ready? OK! Let's get started. Important notes: The end result will be one loaf of bread. If you want to make two loaves of bread at a time, double the flour and water measurements given below, but not the amount of commercial yeast (only used on day 1). See the first breadalong post for a better description of the bread ingredients and tools referenced in the instructions. Also, no chef sacrificing occurs when you are first making the chef. Your flour and water for days 1, 2, and 3 all go into the same jar and nothing comes out just yet. 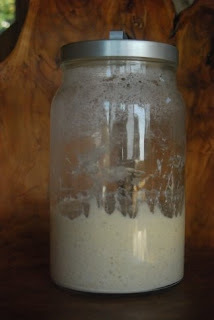 In a glass jar, combine 2 ounces of flour and a pinch of yeast with two fluid ounces (1/4 cup) of water. Stir, stir, stir with a spatula and scrape down the sides of the jar when you are done. You can mark the side of the jar with a dry erase pen if you want to track volume changes in your slurry. Put a loose fitting lid on top of the jar. What your left with looks like pancake batter. Note the surface of your chef - it's smooth and without air bubbles. As the day progresses, you'll see tiny air bubbles dancing on the chef's surface like the ones pictured below. This is a result of that scant pinch of yeast doing its thing and multiplying! Since I'm a gadgetaholic, I have a digital scale with a tare (reset to 0) function. I place my jar on the scale, tare, add 2 ounces of flour and a pinch of yeast, tare, and then add the 2 fluid ounces of water by weight. If you have a scale, too, you can make this easier on yourself by weighing 2 fluid ounces of water and remembering that number so for future feedings, you do not have to use a liquid measuring cup. After all this talk about not using commercial yeast, why do I start with it? Well, you could start by capturing the wild yeast in your area, but if you are in an extremely urban setting, you might not cultivate anything worth turning into bread and it would take at least 12 days or so to have an active culture. I'm patient, but not that patient! Commercial yeast kick starts the process. In the same glass jar with yesterday's mixture, combine 2 ounces of flour with two fluid ounces (1/4 cup) of water. Give this mixture a good stir and put a lid on it. You curious folks can again mark the side of the jar. Note that your mixture is more lively than it was yesterday. You'll see your mixture rise and fall within a 24-hour period. In the same glass jar you used yesterday, combine 2 ounces of flour with two fluid ounces (1/4 cup) of water. Give this mixture a good stir and put a lid on it. Does this sound familiar? Again, your chef will rise and fall in volume over a 24-hour period. Congratulations, you now have a chef! In part 3, we will turn this chef into a levain, which will in turn become pain au levain! Feel free to leave me questions in the comments section! Happy chef making! Mmmm....this is making me HUNGRY and I just ate! I can't wait to read Part III! Ok, I'm absolutely doing this with you, just a couple of days behind. It's birthday days here (all 4 of us in 13 days!) and company is coming in 4 days. I will have time to start it tomorrow, I hope. I'm very excited you're doing this. I've tried other recipes before with little success and heaven help me some day I will learn how to make great bread! Thinking next year a class somewhere - would make a great xmas gift.